Crocodile Pie Recipe Attempt and Review! I have to admit, when I woke up a few days ago, I was not expecting to be attempting to make a Crocodile pie this Saturday! But - follow a number of very exciting emails - I have been tasked with making an "exotic pie - like the Pie-thon pie you made before". 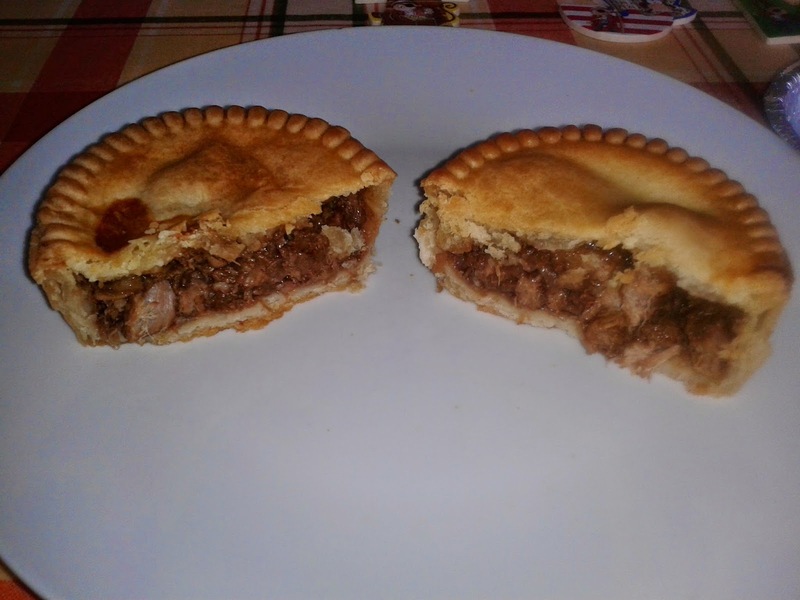 Now, we all know how badly the Pie-thon (Python meat pie) turned out... so my challenge is to attempt to create a crocodile pie reciPIE that is both presentable and edible - a bit like the homemade Horse and Zebra pies we made last year! Regulars to our pie blog will know that we have eaten a whole menagerie of exotic animals in commercially available pies during our time on the Pierate Ship - including Camel, Ostrich, Bison, Kangaroo, Zebra, Horse, Wild Squirrel and a Crocodile Pie! And the last one is kind of the issue... The Nice Pie Crocodile pie was so well rated that I don't think I'll ever be able to match it! At 6.39/7, that is an incredible score for an exotic pie (or pie in general) on our 7 Cs of pie rating! But I'm willing to sink my teeth into the challenge and see if I can make a half-decent crocodile pie for my special guest pie raters! The crocodile meat was already purchased from www.exoticmeats.co.uk and came in a frozen state as part of their "African Selection Box" - hence already making a Zebra pie, Springbok pie and Wildebeest pie. But back at home with my ingredients at hand, I was ready to attempt a first on the Pierate Ship - Crocodile Pie! Step 1 - Heat the chicken stock in a lidded saucepan and then add the chicken crocodile meat for 10 minutes. Step 2 - Create the creamy sauce, containing leeks. Step 3 - Cut up the cooked crocodile meat and add to the sauce. Here's where I then went a bit AWOL and decided to slow cook the pie filling for four hours, just to add a bit more tenderness to the meat. Step 4 - Make the pastry using flour, butter and egg. Make sure you line the whole dish - we are DEFINITELY not making a top-crust here! Step 5 - Input the filling into the pastry casing. You will notice that I actually added some additional peas into the mix, just to baulk out the filling slightly (crocodile steaks aren't exactly the biggest!) and add a bit of extra texture plus one of your 5-a-day! Step 6 - Add the pastry lid and, if you're feeling creative, a pastry crocodile to the top! (Just in case you forget what's inside the pie!) An egg glaze will help improve the colour of the pie. Step 7 - Cook in the oven for 35-40 minutes on Gas Mark 6. Step 8 - Serve an extra slice to your guests! 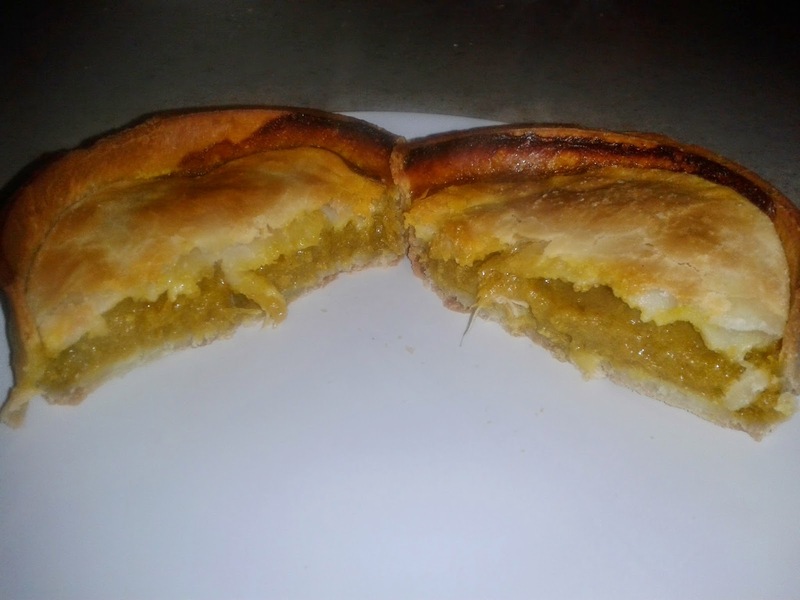 continue reading "Pierate's Crocodile Pie Recipe attempt!" In our search to find what makes the best Scotch Pie we have been looking at producers big and small. Today sees the turn of supermarket chain Morrisons to come under our proverbial pie microscope to examine if their take on this classic pie is any good. Given that I am also trying to review every pie on the Morrisons pie counter I thought I would go for a bit of a double header. 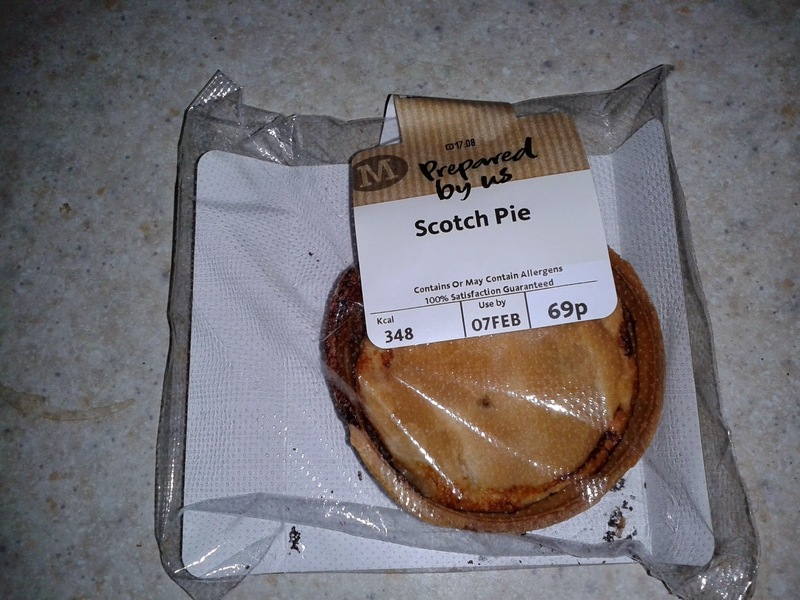 Morrisons also have a Chicken Curry Pie which uses the classic Scotch Pie case and reinforces the Northern roots of the supermarket chain (see our article on what makes the best Scotch Pie to see what makes these cases different). The Chicken Curry pie was slightly more expensive at 89p but neither of these pies were going to break the bank, both being relatively cheap. They weren't very big pies but still represented some of the cheapest pies available. They were indeed made in very similar cases with classic, crunchy Scotch Pie pastry. But which would win the much coveted title of 'Best pie in a Scotch Pie case being sold at Morrisons in 2014'???? Condition 3.0 - Excessive boil out had caused the top of this pie to have a burnt effect. A bit too lumpy. 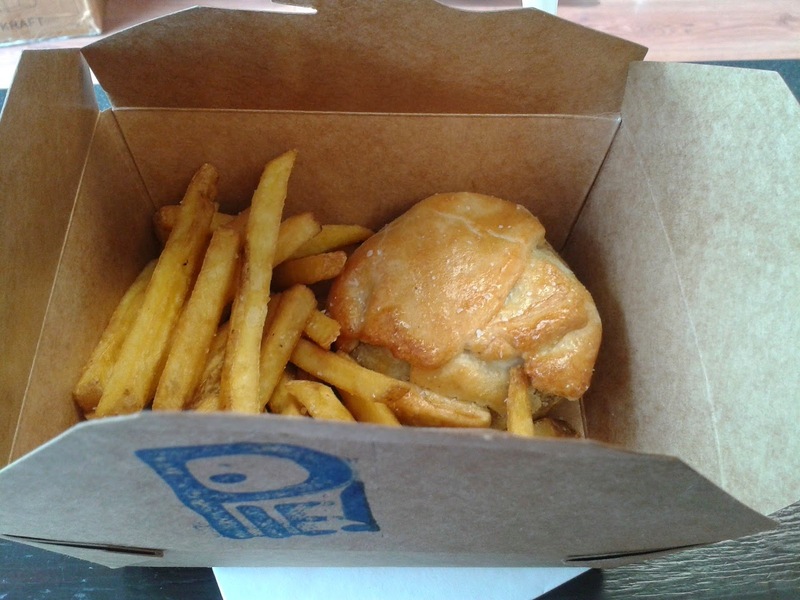 3.2 - The pie had a bit too much boil out to be pretty, but not as bad as the Scotch pie. There was a tinge of yellow where the curry sauce had leaked out. 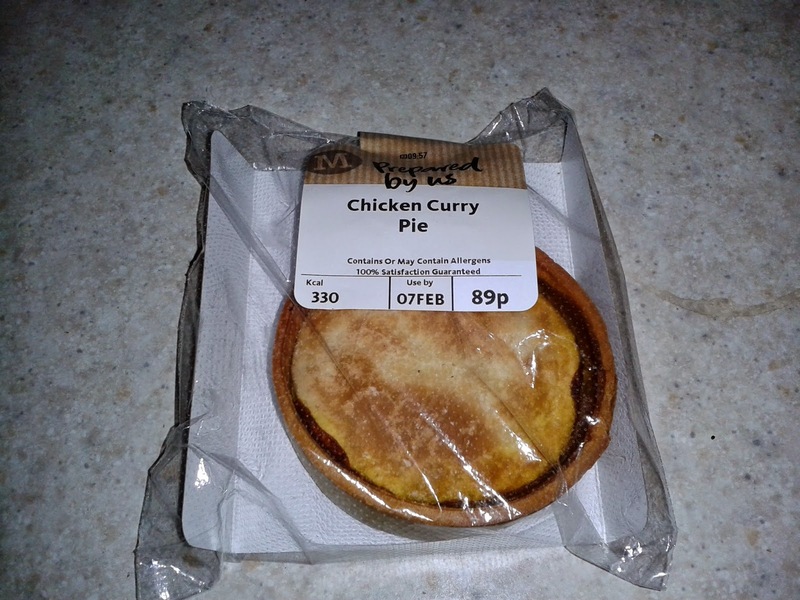 Cheapness 6.5 - At 69p and considering this pie was quite full of meaty content, this was great value. 4.5 - Slightly more expensive, but still quite cheap, however, there seemed to be a lack of meat in this pie which meant it felt mediocre in terms of value. Capacity 4.2 - Not bad, the rim at the top of the pie wasn't too excessive and there was minimal airgap. 3.2 - The rim did seem to be a bit excessive on the Chicken Curry, the filling was pretty shallow despite a small airgap. Chewiness 5.5 - A great texture, crunchy pastry coupled with a nice and moist filling, only the rim slightly let this pie down (it was a little too hard). 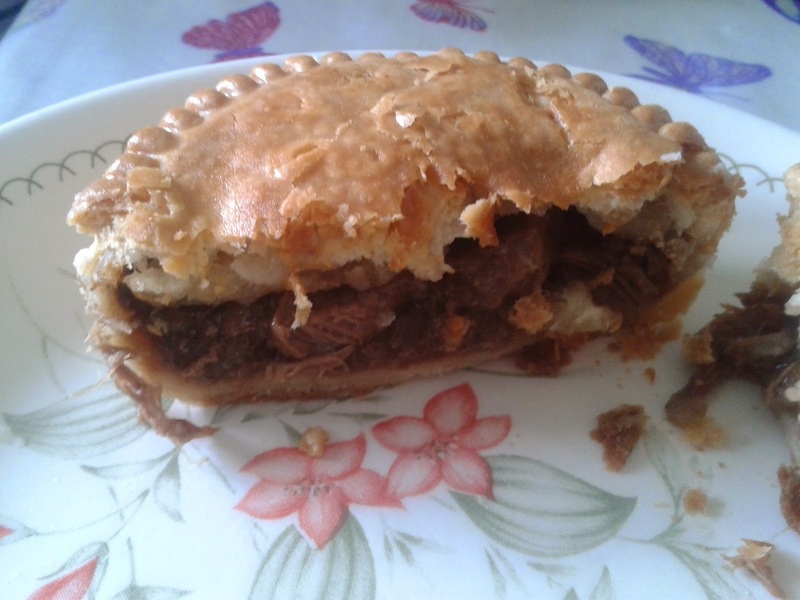 4.5 - Similar pastry crunch to the Scotch Pie, the filling had a slightly less pleasant texture being a bit too liquid. Content 3.3 - A standard minced beef filling. The taste of the filling was a little disappointing, it wasn't meaty enough. It had a slightly peppery kick but was a bit bland. 2.3 - Not a filling that I would recommend, the taste of a bland chip shop curry sauce. There wasn't really much in the way of chicken but a vague taste of chicken. Consistency 4.0 - Fatty and oily, just like you would expect. A pretty good example of a quintessential Scotch Pie (if not a great Scotch Pie). Have tried this multiple times and it is consistent. 3.0 - This pie doesn't really work, there just isn't enough attention to the filling, I did get another one to check they haven't got better. They haven't. The classic Scotch pie wins outright! In truth, it wasn't very difficult, the Chicken Curry pie didn't put up much of a fight. But I won't take this away from the Scotch pie. If you are quite into your Scotch pies (like me) it is a pretty good option in terms of supermarket versions. They are also quite often on offer so it is something I would buy again. continue reading "The Case of the Scotch Pie"
The Scottish Vote: Should pie be served at a Hospital? 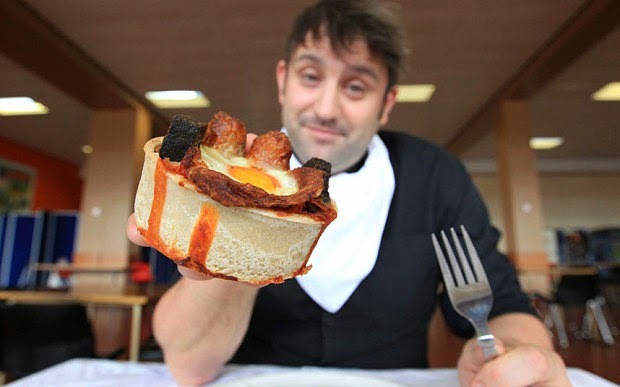 "@BBCRadioScot: A "fry-up" pie is being sold in a hospital. @LWhiteMedia asks: Irresponsible or responding to demand?" Piefectly alright. Is it a pie? 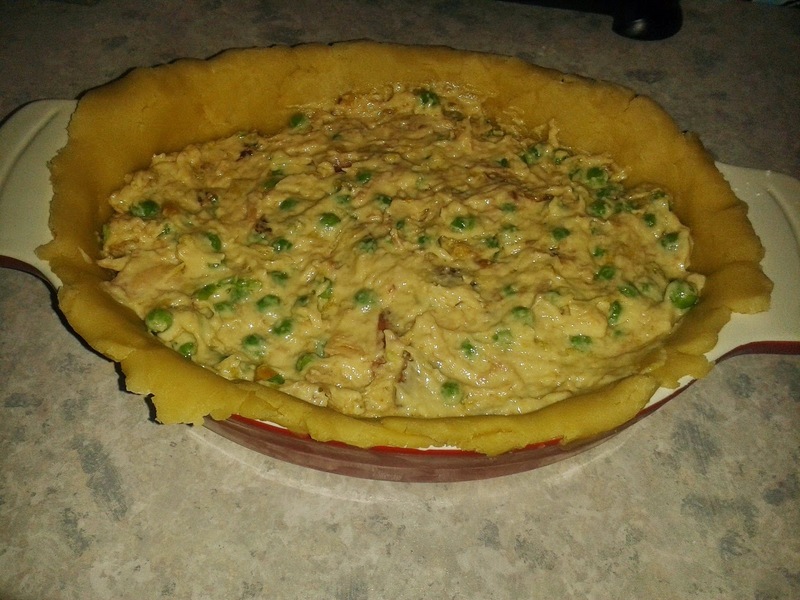 - While unfortunately not having had the chance to actually eat and rate this pie yet, having had a look at the photos this does not appear to be a fully encased in pastry product with clearly defined base, sides and lid. It certainly doesn’t meet our definition of a true pie! You can see the egg, bacon and other content – which shouldn’t be so if the pastry lid is doing its job – so I think this is really a tart. Pie brings great joy and hap-pie-ness to all that eat them – so why would you deprive hospital patients, staff and visitors of this chance of a pastry treat as comfort food?! It’s up to the patient, staff or visitor to decide if they want to eat a pie or a nutritional salad – pie contains a lot of important food substances too, even if this ‘fry up’ pie is not a great example of this. This particular pie was on offer in the hospital shop – not even the hospital canteen or being served up to the patients! So what’s all the fuss about?! continue reading "The Scottish Vote: Should pie be served at a Hospital?" It has to be said that there are definitely not enough pie shops out there – shops which are built on the quality pies they produce and not just tagging pies onto an already overloaded menu board of non-pie meals. Of course London is famous for its traditional pie and mash shops, but barring a few notable exceptions, pie shops are few and far between. 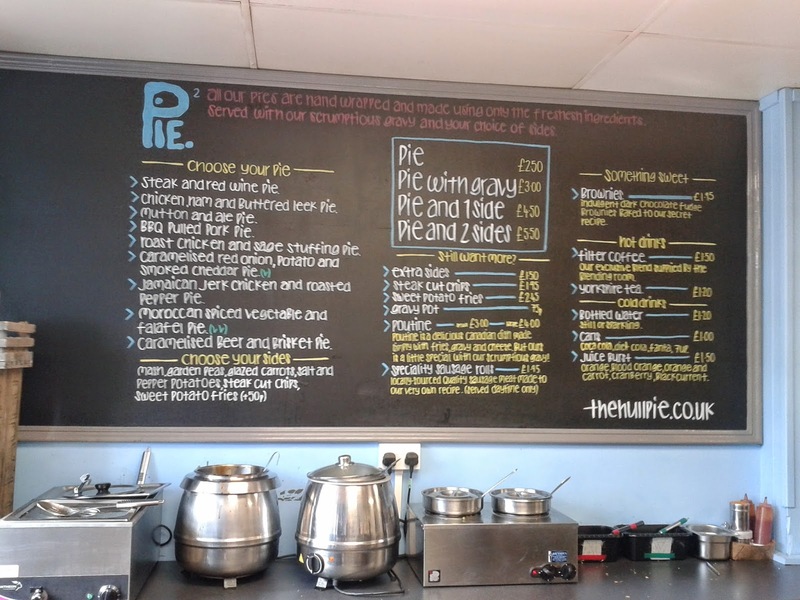 Which is what makes it an absolute delight and pleasure to introduce you to “The Hull Pie” – a modern take on the traditional pie shop with some absolutely quality pies, served in Hull. 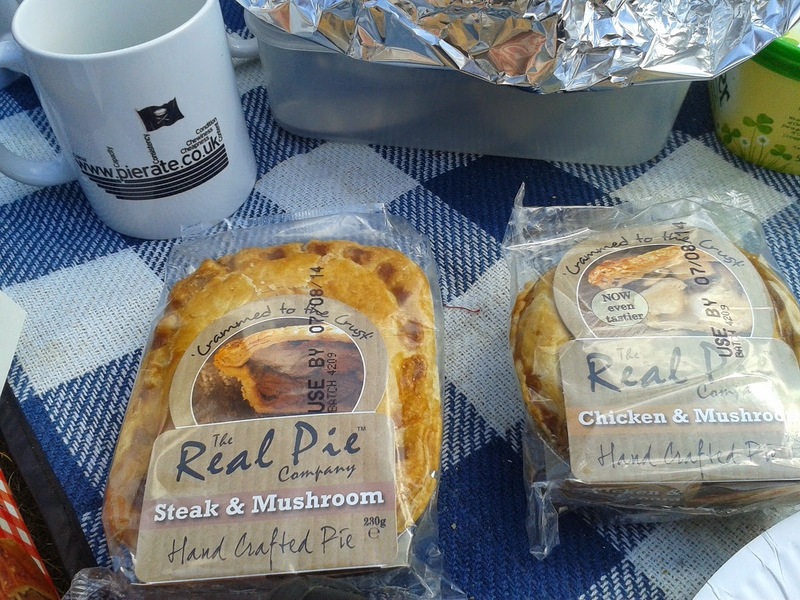 The Pierateers themselves got to try these pies on a recent road trip to the Humberside area - travelling well over 200 miles on one of their #PieTour visits after a lot of Hull-abaloo about how good these pies were on Twitter - and believe me, we were not disappointed! The following pies were great and the only downside was that we arrived in Hull too late to get to the main The Hull Pie shop in the city centre, instead going to The Hull Pie 2 – their takeaway shop which has extended opening hours including opening on Sundays. Our imPIEression of The Hull Pie 2 was that it was a bustling hive of top quality hand produced pies, which you could actually see being made as you entered the shop. This is a real plus, as you do sometimes wonder what your pie is being filled with as you wait to find out what quality of pie is carried through from the kitchen at the back on your plate. Full marks to The Hull Pie for their openness and transparency in the pie making process. And I’ve not even got onto the pie menu board, which was packed with a wide range of intriguing flavours – including many which would be making their debut on the Pierate Pie Rankings list! 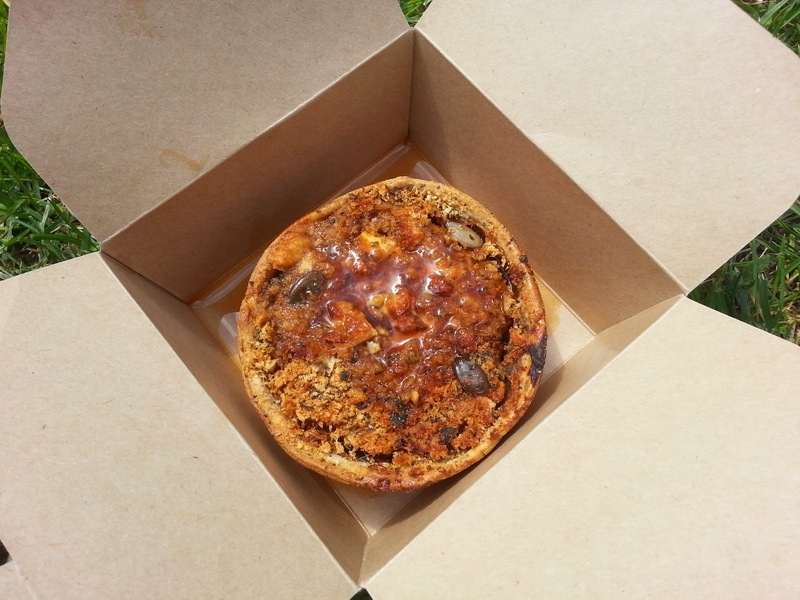 The pies below – Jerk Chicken and Mutton and Ale – are both new pie flavours and again The Hull Pie have excelled themselves in thinking outside of the pie box! But how would these unique flavours rate? Would they work well in a pie? Fortunately we have the 7 Cs of pie rating to determine that! At £2.50 for just the pie, packed full of meat, this was an absolute steal! Queries however over the lid: These pies were seemingly made from a single piece of pastry, wrapped over the top of the filling, thus fully encasing the filling but not having a clearly definable lid. In their favour, there was a clear side, base and topping, but there was no way of just “lifting the lid” and dunking your chips into the filling. While definitely a pie, they do not quite embodying the quintessential essence of pie-ness that we Pierateers look for. Also, partly because they were cooked and served in a metal case, the base pastry was a bit soggy. Not in an “I can’t eat this” sense, but a slightly firmer, crispier base pastry would have been pie-deal, like the sides and top were. I loved the choice of interesting flavours from around the world. What was brilliant for this pie was that it could be accompanied by sweet potato fries which went very well. 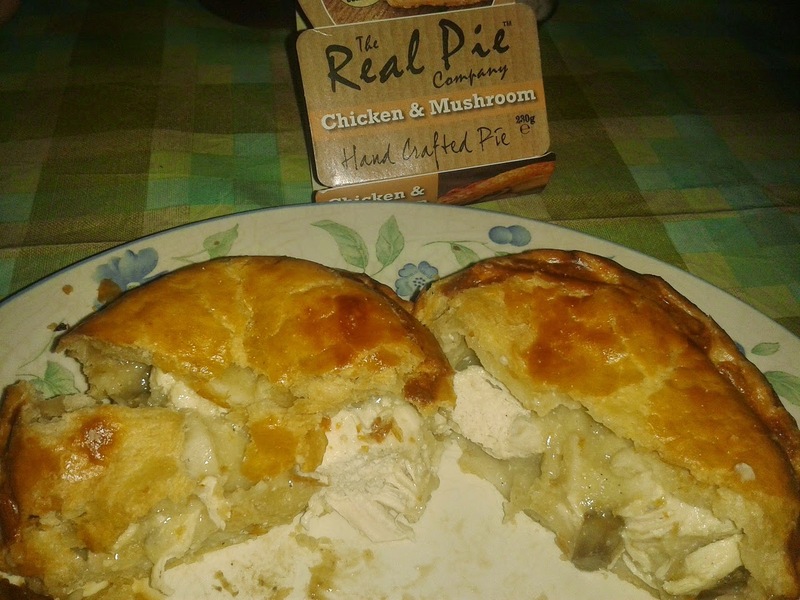 Condition - 4.9 out of 7 - Very well presented, this pie really looked the part when in its foil case with a rustic, handmade appearance. There was a minor draw back in that when taken out of its foil case it appeared that the pie was in fact made from one piece of pastry which had been folded over, a bit like a pasty. Not quite embodying the quintessential essence of pie-ness that we look for. Colour - 6.0 out of 7 - A range of colours taken from the golden sunset brown collection. Cheapness - 6.7 out of 7 - At just £2.50 for the pie alone, which was jam packed with meat, this was about as good value as you can find anywhere. Capacity - 6.3 out of 7 - The pie wasn't very large but made up for this by being completely full of meat. 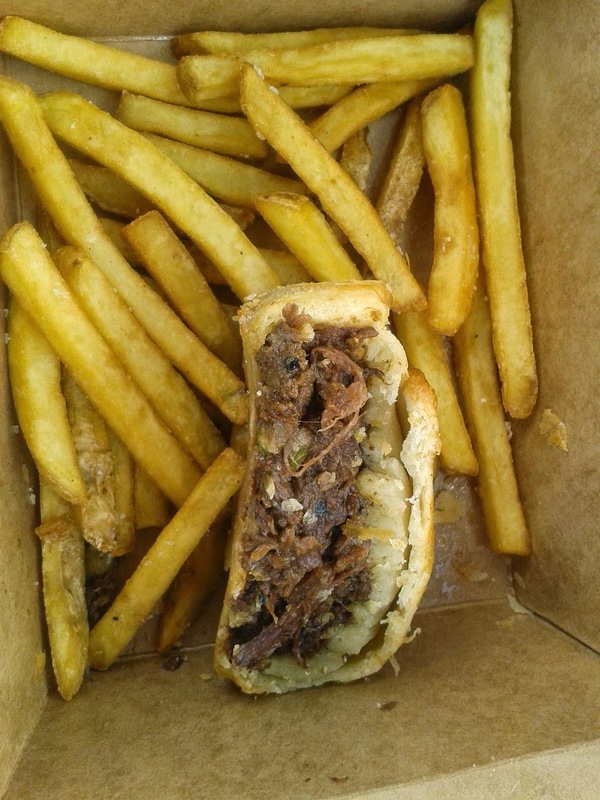 Chewiness - 5.9 out of 7 - The filling for the pie wasn't at all chewy, as you would hope for with a chicken pie. 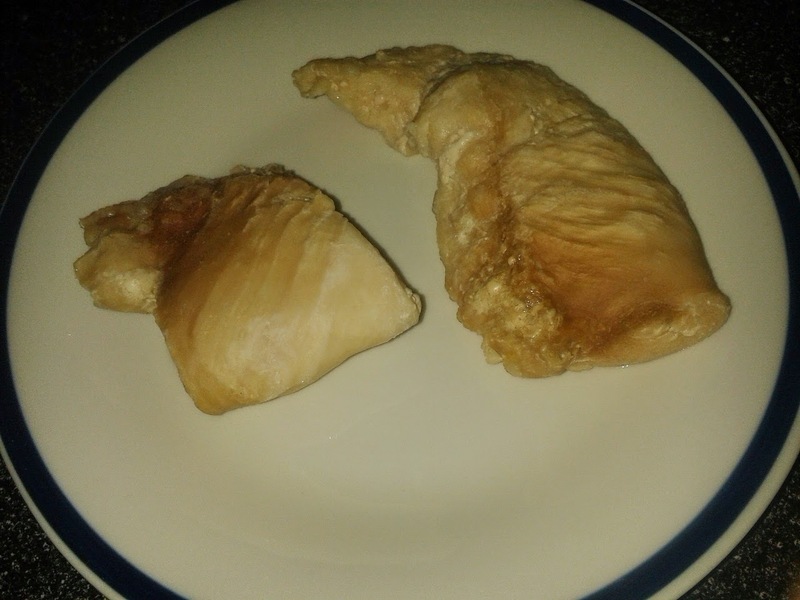 It had a wonderful texture, indicating good quality chicken. The pastry had a bit of a funny texture in places, it was perhaps a little soggy at the base. Content - 6.9 out of 7 - I lived in Brixton and became quite familiar with jerk chicken while there. The flavours in this jerk chicken were up there with the best. The sweetness of the pepper complemented it perfectly and added an interesting variation to the filling. Consistency - 6.8 out of 7 - There wasn't a lot of sauce to this pie which perhaps helped them fill it up so well without it boiling out. This didn't stop it being very moist and slipping down very well. It really was a master stroke to put jerk chicken in a pie, it worked very well, although the pastry wasn't quite perfect, the filling was incredible. Another incredible pie flavour from The Hull Pie! While you might not think of Mutton as an unusual pie filling, we have not found any previous Mutton pies on our travels – and certainly not Mutton and Ale. The filling was so moist, a slight surprise given there was no specific gravy oozing out of the pie upon biting into it. And yet the meat was so incredibly tender – what a fantastic effort. The ale added such nice flavours to the pie, with a bit of vegetable to compliment it all, again well cooked and melt in your mouth. The pastry was good – really nice to eat even on its own (not that you got much chance of that with the capacity absolutely ram packed with meat!) The base pastry was a little soggy, but indicates the moisture and tenderness of the meat filled pie. A little firmer base and a proper, separate lid and this pie really would be challenging for the very top of the pie rankings! 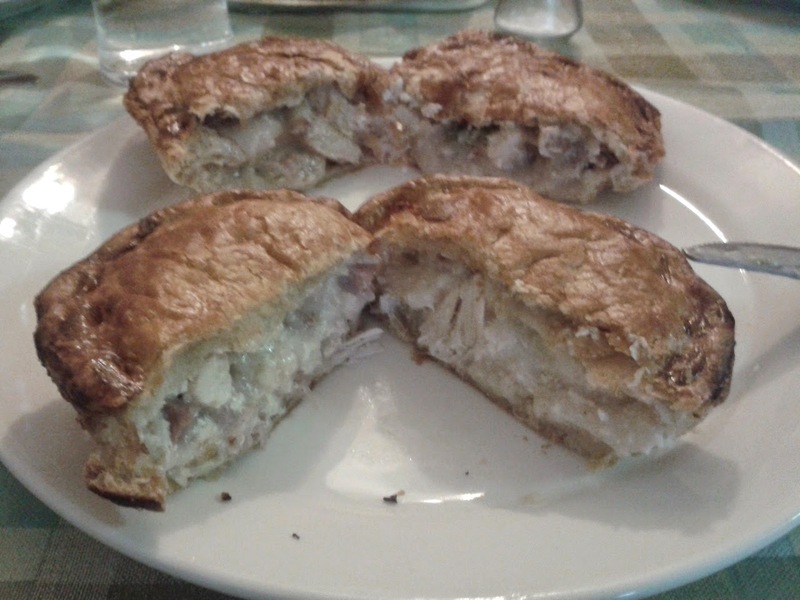 So The Hull Pie were certainly well worth a road trip for and, while there were a few more The Hull Pies we still have to rate which didn’t quite score as highly, these two pies are certainly worth their Pierate Highly Recommended status and we would certainly love to eat them again! 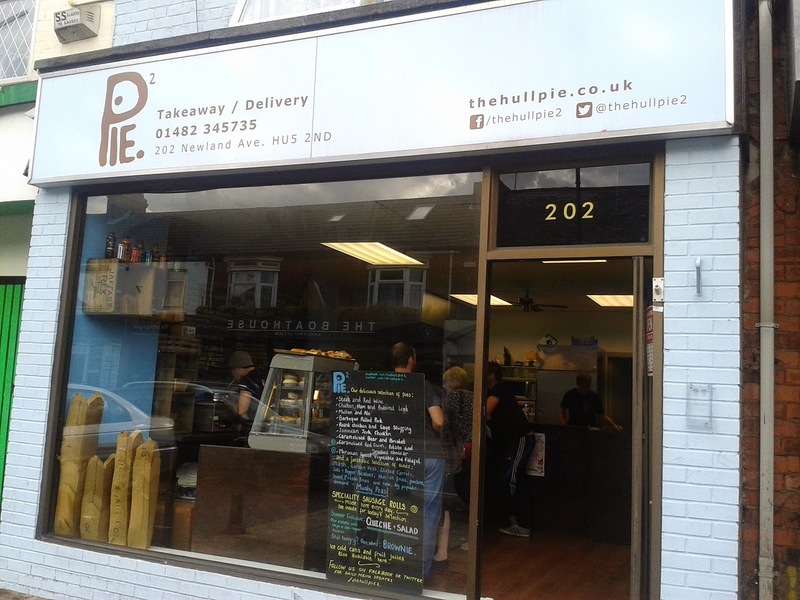 continue reading "The Hull Pie - One Hull of a Pie Shop!" I’m going to have to start this post off with a disclaimer – I don’t love cricket, I like it. There you go. Not a great marketing campaign slogan, I know, but as you will no doubt realise by now our love lies elsewhere on the Pierate Ship. Which is why I have to say I’m bowled over by decision of the catering management at Edgbaston Cricket Club in Birmingham (home to the Birmingham Bears 20-20 Cricket team) to sell pies in their cricket stadium! Yes, you read that right! Pie at Edgbaston? That’s just not cricket! But while other cricket grounds may be stumped at what food they can sell to keep the cricketing fans happy, Edgbaston’s catering team have got a quick wicket with the catch of catering world – a fully encased pie which no one will want to let slip. You’d be bat-ty not to go for one really. And if you're ever in need of a pie recommendation, we're the ideal umPIEres for that - with tons of pies rated and reviewed for you (over 400 in fact!) You'll no longer have to ask "Howzat?!" when needing a pie - just check out our pie rankings! So if you’re at Edgbaston today to enjoy the 20-20 finals day, why not check out the pie catering options available (particularly sold in the new main stand, where I bought my pie a few weeks ago for pie friend Caroline’s birthday bash!) Just make sure you get there before they all run out!!! And if you like your pies sporty, then you'll be pleased to hear of the launch of the PIEremiership - our growing list of all the top half-time football pies around the country. 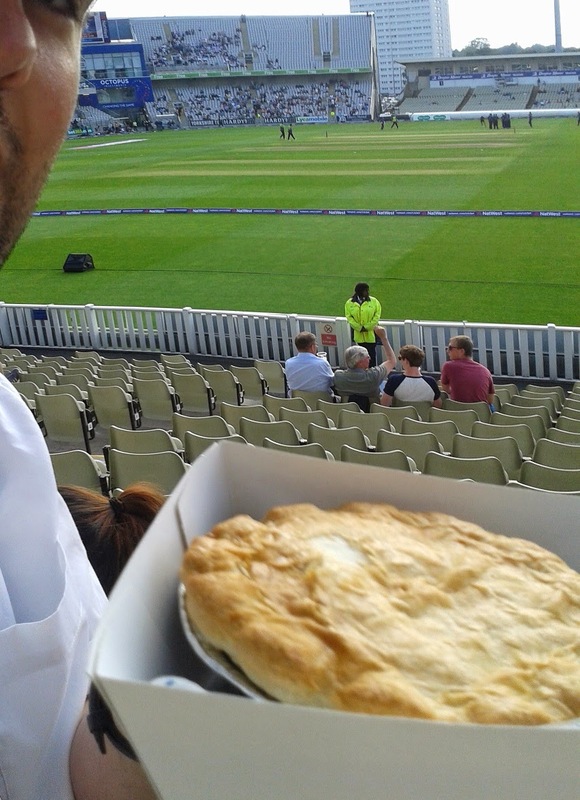 continue reading "Pie at Edgbaston? That’s just not cricket!" 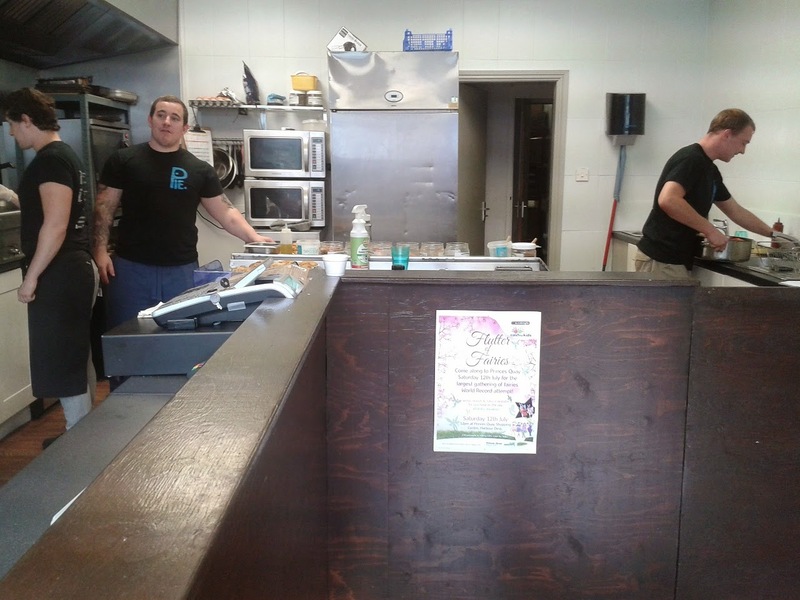 continue reading "Are The Real Pie Company the real deal?!" PIEremiership - Pierate's Football Pie League kicks off! Our new logo to celebrate the re-launch of our football pie article! It will be of no sur-pies to our regular pie blog readers that we have eaten a pie or two at football grounds up and down the country! In fact, we were delighted to be invited as VIPs (Very Important Pie Eaters) to Morecambe FC in January 2014 to rate their pies (and do a 5 minute interview for their website!) and also got special treatment and a free pie at The Emirates Stadium with Delaware North Companies UK. But really, we've only just started! That's why the Pierateers are making a new #PiePledge to visit even more football grounds this season - and quite obviously eat and rate a pie at each one we do! Sure, you may be thinking hasn't someone already done the 'pie at every ground' thing? - and in part, you would be right. But while Tom Dickinson had a lot of success and press coverage for his "92 pies" idea - including a book which we have rated on the 7 Cs - he will be the first to admit he didn't actually rate the pies very much. In fact, they hardly get rated or even mentioned at all in the book! We at Pierate consider this a missed opPIEtunity and are set to put the pies to the 7 Cs test - attempting to rate as many football pies as we can! It may take a while to rate them all - we certainly can't manage it in a season (unless someone sponsors us enough to mean we can quit our day jobs!) - but we hope to rate as many football pies as we can! You'll be able to see the results of our football pie endevours by visiting our "PIEremiership: Pierate's Football Pie League" article, which is now available as a clickable link on the right hand side of the site if you're viewing Pierate on your desktop or selecting the menu on your mobile phone view! 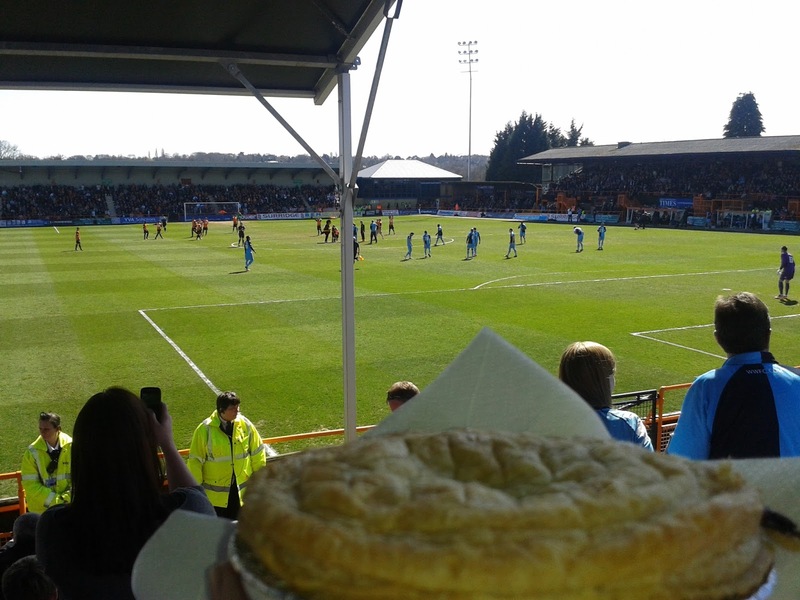 And of course we'd love to hear from you - the pie fans - who have no doubt also enjoyed (or detested) a pie at football grounds up and down the country! Leave a comment in the box below if you have a pie to suggest we rate or avoid! 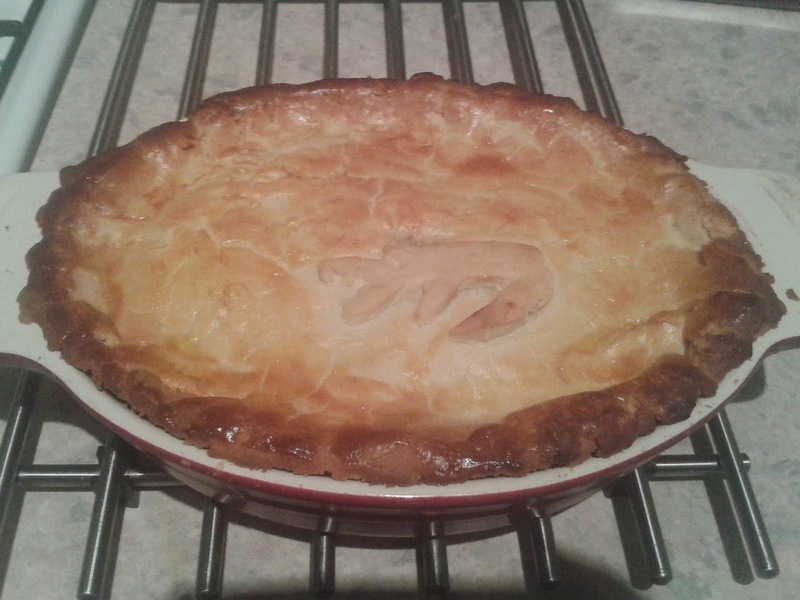 Here's to a great 2014/15 season, both on the pitch and (more importantly) in the pie kitchen! continue reading "PIEremiership - Pierate's Football Pie League kicks off!" 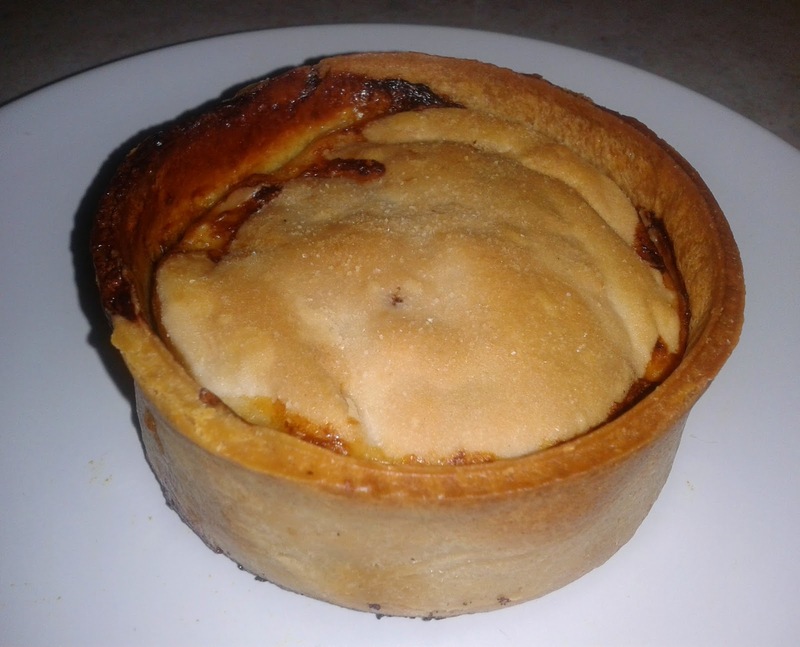 continue reading "Should the Scotch Pie be Independent?" You could be forgiven for thinking that when you've rated well over 400 pies on the web’s leading pie review website, there can’t be many new ways to review a pie?! 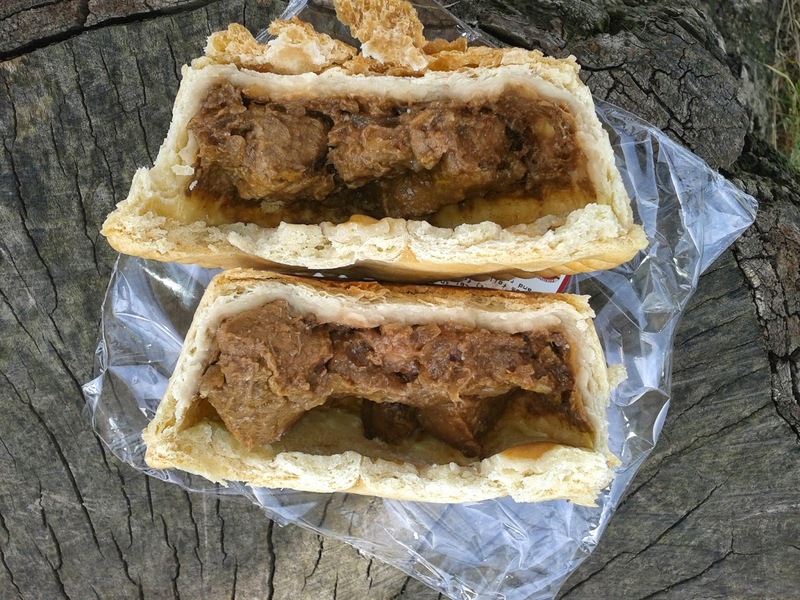 Well, prepare to be amazed as we rate the Pocklington's Bakery Steak Pie and find out if you should pocket a Pocklington's! Cold - It did say that it was delicious eaten hot or cold but we would strongly dispute that it was “delicious” cold. The pastry was just too hard and thick; there wasn't enough sauce to help it go down. This wasn't helped by the fact that the pie we ate cold had a large air gap. However, the pie did well in some of the other criteria. It was quite big for £1.55 and there were some sizeable meaty chunks. It was nice in a way that there was this option for eating cold but I would not recommend it unless you were really desperate. If I was scoring it at this temperature alone I would score it 4.25 out of 7. Not bad, but not something I would recommend. Microwaved - This pie seemed to undergo a radical transformation after a short time being bombarded by electromagnetic radiation. The pastry became soft and tasty, it seemed to lose the greasy taste it had before. Despite this, the pie retained its tall structure very well; often pies will collapse upon being microwave cooked. The pie we used for microwave cooking also benefited from being very well filled. The packed content of meaty chunks was great value at £1.55. Overall, the pie did remind me slightly of a Pukka steak pie from a fish and chip shop, perhaps as they are often reheated in a microwave. It had the same delightfully thick sauce. However, it did better than a standard Pukka, it wasn't so stodgy and had more flavours going for it. There was a nice oniony taste which wasn't overpowered by salt. For this price it was great value and we would score it 5.70 out of 7 if we were scoring at this temperature alone. 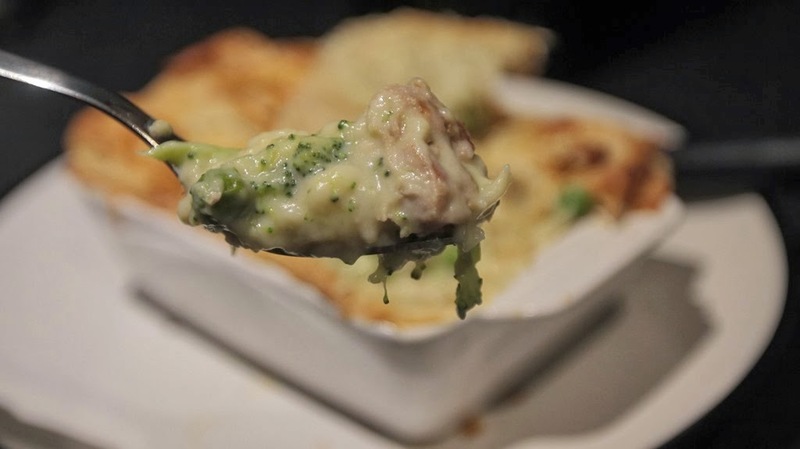 Oven Cooked – As mentioned previously, the pie underwent significant transformation upon the addition of heat – and the oven cooking piped the microwaved version slightly, as the pastry maintained a bit more crispiness than the microwaved version. Again the pie was well filled with nice big steak chunks, particularly impressive for a pie costing just one English pound and 55 English pennies. The gravy tasted so much better warmed up and oozing out of the pie, compared to the unheated version. A definite winner if you can hold out longer than it takes to microwave a pie! We would score it 5.90 out of 7 if we were scoring this pie oven cooked. The reviewing of this pie over three different cooking/non-cooking levels does leave us with a slight quandary – which score should make it into the Pierate Pie Rankings?! We’ve decided that the oven cooked version should be the nominated score, as this reflects the best way to eat this pie – which is something we are always looking for on board the Pierate Ship. Sure, if a pie box says it’s a microwavable pie, we should score it microwaved, but for this pie we prefer it oven cooked. Still, it is a Pierate Recommended pie eaten microwaved or oven cooked. Well done to Pocklington’s Bakery! We enjoyed our little search around the North Lincolnshire area to find a store selling your pies (just remember to look for the Lincolnshire Co-ops – not just all the Co-ops in Lincolnshire!) and – while we only found the steak pie on sale in the shops we visited – we sure hope to pocket another Pocklington’s pie in the near future! 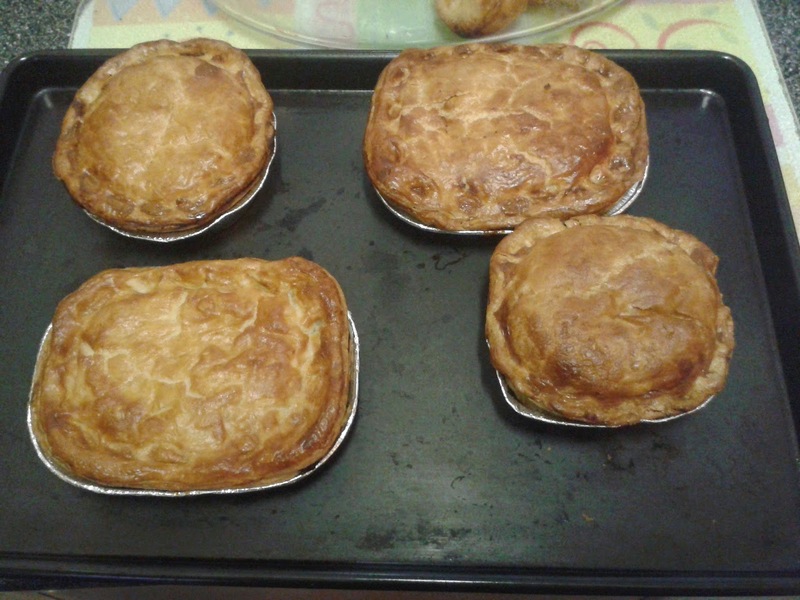 continue reading "Should you pocket a Pocklington's Steak Pie?" 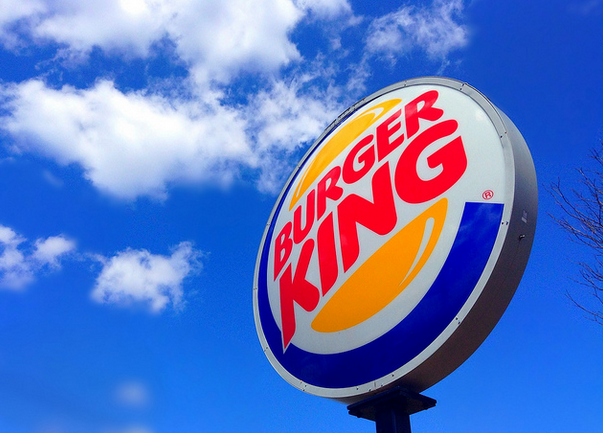 Reports are circulating that a man bought the entire stock of apple pies in a branch of Burger King in a bid to spite an "out of control" child and his mother behind him in the queue. Explaining his whopper of a pie purchase, the man wrote on reddit "‘This kid was out of control, screaming, punching his mother, throwing around a gameboy whenever something didn’t go right in the game." After the child started screaming for apple pie, the man asked the mother to settle the child down. However, he was ignored and told to mind his own business. 'I then decide to ruin their day', writes the man, as he proceeded to buy all of the 23 remaining apple pies in the store. The official Pierate statement is: it wasn't us (although we did recently have 28 Holland's Steak and Guinness pies). We hope he thoroughly enjoys his pies - he deserves them. Mr Burger King pie man - we salute you. continue reading "Man buys entire store's worth of Burger King apple pies"
Pieminister have added 'Lighter Pies' to their range - seemingly in response to a growing consumer trend towards lower calorie options. The range includes "light as a feta" - a butternut squash, feta and sundried tomato pie, "kooky chook" - a free range British chicken, sweet potato, coconut and chilli pie, and "chickalito" - a free range British chicken and dry cured ham pie. But what happens when a "lighter" pie is literally lighter, yet still costs the same? Today, and also previously, under the Pierate knife is the Chickalito pie. It's a pie that is (literally) surrounded with controversy. 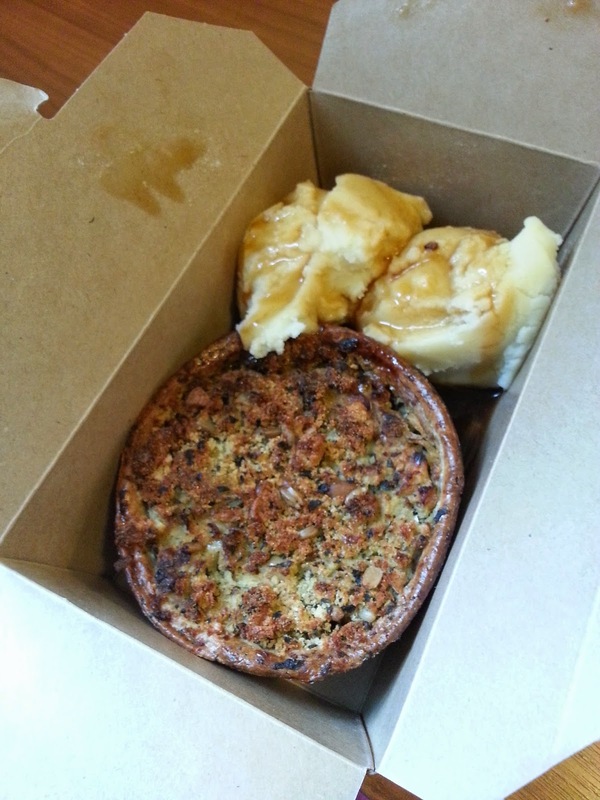 With these new lighter pies, Pieminister have made the significant decision to do away with the pastry lid, instead opting for a herb and seed crumb topping. For instance, here the chickalito's chicken, ham, courgette and celeriac filling is topped off with a pine nut, sunflower seed, basil and Parmesan crumb. Pierateer RAS has already done the service of rating this Pieminister chickalito pie, but since I've eaten it myself I thought I'd weigh in with a few views of my own. I won't go through the details of how the pie tasted because I agree very much with what RAS has already said, but what confuses me about this pie is that, despite weighing only 240g, it costs the same as a regular 270g pie (prices checked on Ocado 05/06/2014: moo pie £3.50, chickalito pie £3.50). So these Pieminister Lighter pie are literally lighter than their regular counterparts, and hence cost more per gram of pie. But not only that, the Lighter pies are billed as the lower calorie choice. But how much lower calorie are they compared to Pieminister's classic offering? I did a bit of number crunching and munching on the calorie contents of the pies, and it seems that while the Lighter pies do indeed have fewer calories than the classic pies, the difference isn't as great as you might think. For instance, the lighter kooky chook pie has 182 kcal per 100g. In contrast, the classic wildshroom pie has 190 kcal, the moo pie has 200 kcal, and the deerstalker has 204 kcal. The big question is, then, is it really worth sacrificing the pastry lid just to cut out a few calories? The above thoughts, however, are far less important than the actual question of whether these Pieminister pies are any good. And to find out, I just had to try another pie from the range (I know!). 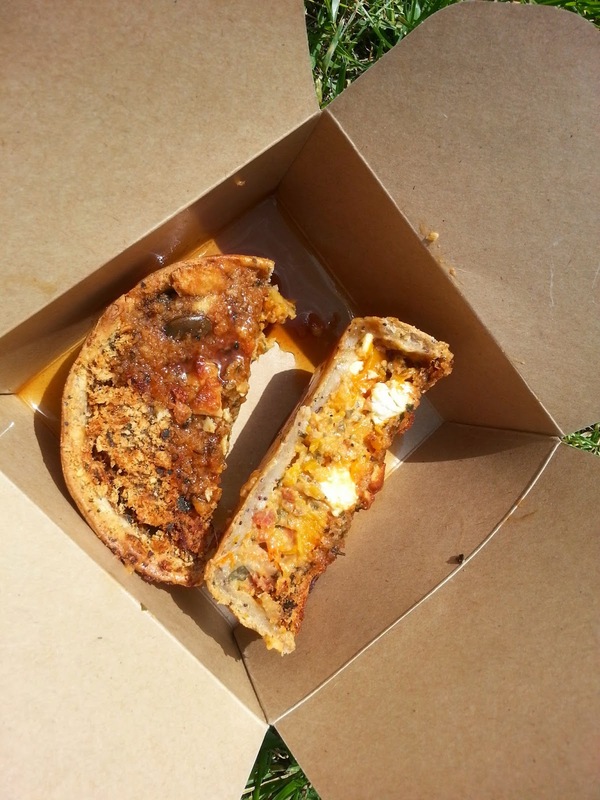 This one is a vegetarian pie called Light As A Feta, and it is a butternut squash, feta and sun-dried tomato pie. Retailing at £3.50, this is at the more premium end of the supermarket pie spectrum, and as already discussed, there is some controversy over pricing this 240g pie the same as a regular 270g pie. 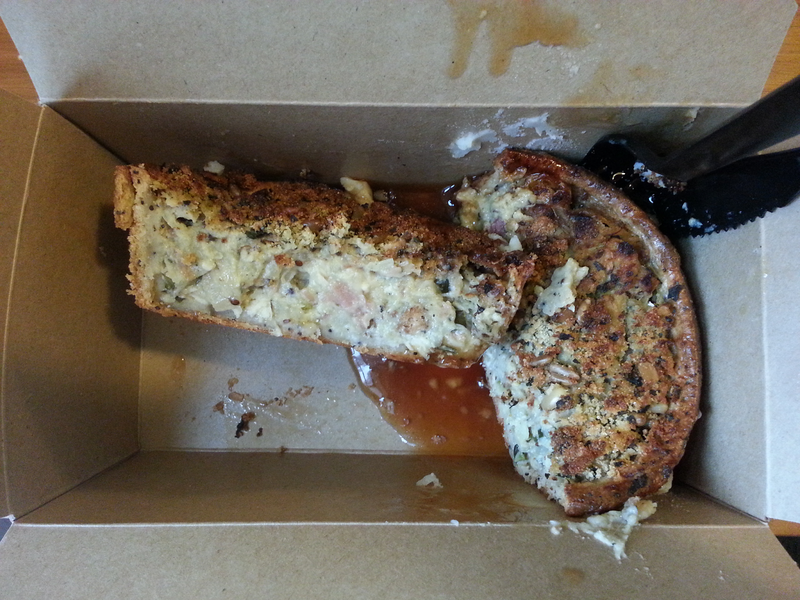 I bought this pie from a stall, and spooned only a little gravy on the top. Slicing open the pie, you can see the yummy looking contents complete with a few chunks of feta cheese. However it's impossible to comment on an air-gap since this pie has no lid. Regardless of this, it seems this pie is filled nearly up to the level of the brim of the pastry. The lack of depth to this pie makes is more akin to a quiche that a pie. If the pastry were a little softer, you would be calling this a quiche, really. That said, the filling was delicious, it really was. It tasted fresh like summer and didn't leave me longing for meat (like some vegetarian options can do!). I really enjoyed the filling - certainly the best part of this pie. The feta cheese was delicious and complemented the butternut squash delightfully. The addition of poppy seeds to the pastry was a nice touch. However, I felt the pastry was a bit dry for my liking and required gravy for softening. If the pie had a proper lid, I think the filling could have been more moist without the need for additional gravy. In the case of this pie, I think the lack of lid really held this pie back. In my opinion, it's worth sticking a lid on the top to make it a proper pie. Pierate is a pie review website charting a course to find the ultimate pie. We've already rated a number of Pieminister pies. continue reading "Pieminister Lighter pies under the knife"
continue reading "500 Pierate posts celebrated with Piecnic video!" I am currently very VERY excited, and you should be too. Why? Because the new series of Great British Bake Off is nearly here! To keep myself occupied while I wait impatiently, I’ve been conducting a reci-pie review in honour of the two great baking deities that are Mary Berry and Paul Hollywood. Yes, you read that correctly, I tested out two pies at once this time. It was the battle of the baking legends… Mary Berry vs Paul Hollywood in the GREAT BRITISH STEAK PIE BAKE OFF! 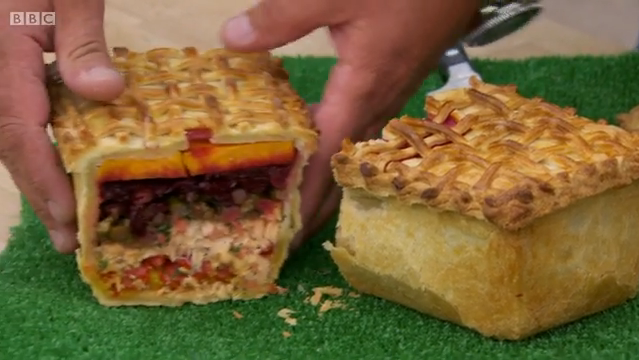 Re-live the pielights of British Bake Off 2013's finale with their Picnic Pie Challenge! See all the pies and our Pierate analysis in our article "Great British Bake Off - The Final: Pie Review Tweets"
It was difficult to choose which pies I wanted to bake because between them Mary and Paul have a pretty extensive baking repertoire. 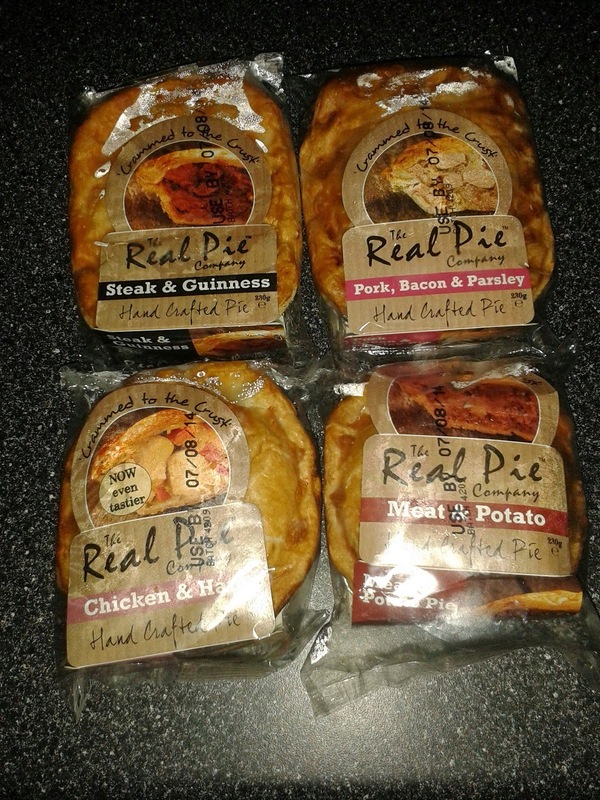 For a fair comparison I chose two steak pies – Mary Berry’s steak and mushroom and Paul Hollywood’s meat and potato. Fry the onions and brown the steak, then add the flour and cook for a few minutes. Then add the stock, Worcestershire sauce, salt and pepper and simmer for 2 hours. Add the mushrooms and simmer for a further 30 minutes before leaving the filling to cool. Meanwhile, make the shortcrust pastry. Use a thin strip around the edge of the pie dish, then top the pie with the rest –(use a pie bird in the middle). Cut off the excess pastry and crimp the edges, make sure there’s a hole in the top for the steam to come out and then brush the pastry with beaten egg. Cook at 200 degrees C for 30 minutes. Put the onions, steak, salt and pepper in a pan, with just enough water to cover them. Simmer for 1 ½ hours, then add the potatoes and simmer for another ½ hour or until the potatoes are cooked. Pour off some of the liquid to use as gravy (leave enough so that the mixture still has some sauce) then leave the filling to cool while you make the pastry. Use a thin strip around the edge of the pie dish, then top the pie with the rest, cutting off the excess pastry and crimping the edges. Make a hole in the top for the steam to come out then cook at 200 degrees C for 30-40 minutes then rest for 10 minutes before serving. Both pies scored very highly in this category, with Mary’s pie turning golden brown and Paul’s a slightly darker brown. Both kinds of pastry looked crispy and appetising. Mary’s pie scored slightly higher here, as the gravy in this pie was a little bit thicker than Paul’s, and the Worcestershire sauce made it taste just that little bit nicer. However Paul’s does give you extra gravy to pour all over your pie/mash/chips/peas/beans/whatever, which is a bonus, so again it was pretty close. I hate to say it, but neither Paul nor Mary scored very highly here because both recipes call for a top crust only. Technically there was plenty of filling in the pie dish, but I’m writing for pie purists here so I’m going to have to deduct some points for the lack of pastry bottom and sides. Luckily, Paul and Mary have redeemed themselves here with top marks. The beef in both pies is deliciously soft and melts in your mouth, the mushrooms in Mary’s pie and the potatoes in Paul’s pie add an interesting texture and the onions in both are soft and melty and delicious. I kept eating both fillings while I was waiting for them to cool because they were so tasty. There really isn’t much in this. Both pies are very reasonable, with only a few ingredients that aren’t store-cupboard staples (in fact as I usually have mushrooms, onions and potatoes for other recipes the only things I needed to buy were beef and suet). You also get massive pies so you can either feed all your friends and family or hang onto the leftovers for future meals, so you’re going to get good value either way. I’ll be honest, neither of these scores points for originality, but the classics are classics for a reason. Both pies are delicious. In our house Mary Berry won (but only just) because we liked the gravy in her pie better, but no self-respecting pie fan is going to turn their nose up at either of these. Both pies came out of the oven looking beautiful, and they held together really well when we served them. Top marks for both. I’m just not sure I can choose – it’s going to have to be one of those rare Bake Off weeks where no contestants are sent home. When I tasted the fillings I was pretty sure Mary had won this one – I cannot oversell that delicious gravy. 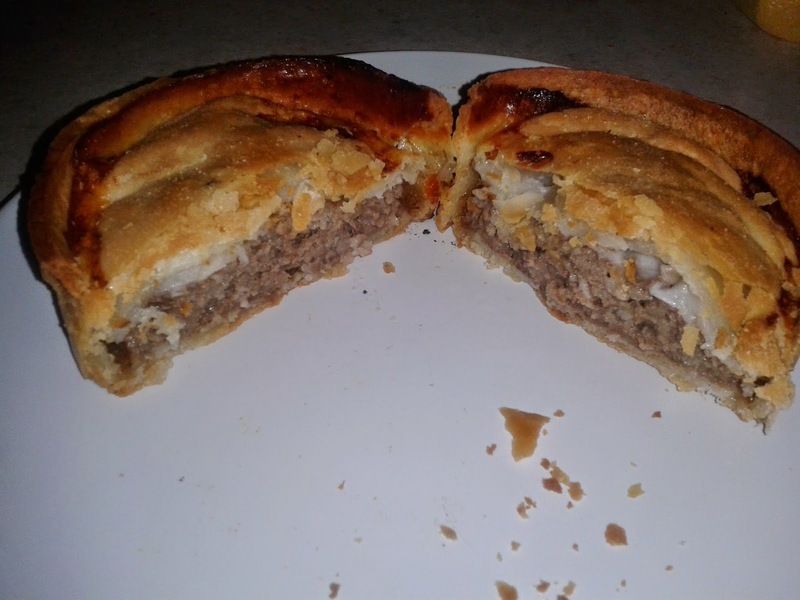 Unfortunately the competition was made more complicated when I tried the pastry…don’t get me wrong, I love shortcrust pastry on a pie, but Paul’s suet pastry was just so golden and crispy, with such a lovely flavour from the beef suet, that I kept going back to both pies for more! I’d definitely encourage you to try these pies and see which you think is best, though I bet you won’t be able to choose either! To be honest, I think the ultimate pie would use Mary’s filling with Paul’s pastry – which just goes to prove that they make as good a partnership when it comes to pie as they do when it comes to Bake Off judging! 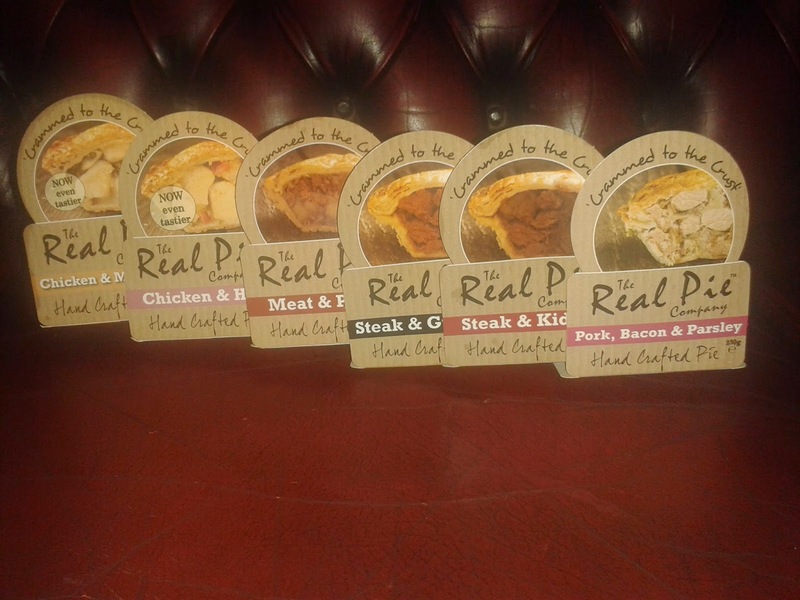 continue reading "Reci-pie Review: The Great British Steak Pie Bake Off"